Easily connect USB devices without fumbling with the connector. Tripp Lite Reversible USB cables have connectors that work in either direction, so you don't have to look to see which is right-side-up anymore.Notes:1. USB Male-to-Male cable is not a standard USB cable configuration, and is only used in rare instances where a peripheral or patch bay employs a USB A-Female connection, in place of USB B-type port.2. This cable will not work as a PC-to-PC connection. File sharing between computers requires special, software-driven file transfer cables, such as Tripp Lite U233-006-MP-R. 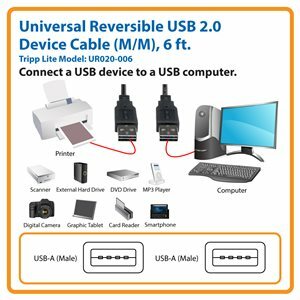 The Tripp Lite UR020-006 Universal Reversible USB 2.0 Hi-Speed A/A Cable (M/M) connects the USB Type-A port on your computer to a USB Type-A device, such as a hard drive or USB hub. Unlike traditional USB cables that can be attached only one way, the UR020-006 has two reversible plugs that connect to a USB port in either direction, making installation easier and faster. The six-foot cable supports USB 2.0 data transfer rates up to 480 Mbps. It’s backward compatible with previous USB generations. NOTE: The UR020-006 will not work as a PC-to-PC connection. To share files between computers, we recommend Tripp Lite’s U233-006-MP-R. The UR020-006 features premium foil and braid shielding to deliver reliable, error-free signal quality and protection from EMI/RFI interference. Molded nickel-plated connectors with gold-plated copper contacts ensure excellent conductivity. Integral strain relief ensures the cable and connectors last a long time. A rugged PVC jacket protects twisted 28 AWG data lines and 24 AWG power lines. The UR020-006 comes with a lifetime warranty. It’s manufactured in compliance with strict RoHS specifications, reflecting Tripp Lite’s commitment to environmental responsibility. UR020-006 Universal Reversible USB 2.0 Hi-Speed A/A Cable (M/M), 6 ft.